Cardbomb: Butterfly Thinlits Thank You! I was so excited last week when the Butterflies Thinlits came back in stock! I had some customers who were very excited too and made their Butterfly Basics Bundles and Butterflies Thinlits orders as quickly as possible. 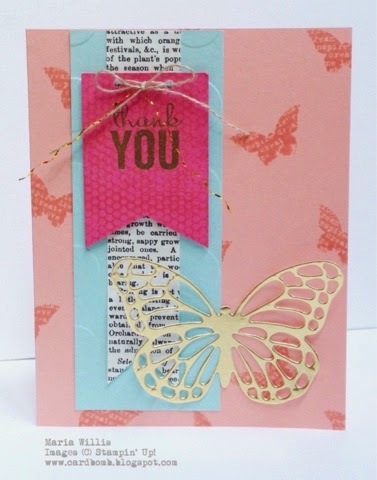 I thought a fun way to thank them would be to send them a card using the Butterfy Basics Bundle so they have one more idea of what they can make with their new products. Here's what I'll put be putting in the snail mail tomorrow. I hope they like them!